Soviet kids ate nearly all their meals at school, and like school food the world over, it left much to be desired. I went to kindergarten in 1991 and just missed being an “oktyabryonok” and seeing portraits of Lenin on the walls of the playrooms. However, I certainly didn’t miss out on Soviet kindergarten food. I especially remember poldnik – the snack after lunch and before dinner – which was often a boiled egg. I hated egg white, so I’d eat the yolk and crumble the egg white with the shell and sneakily throw it out. Later I made friends who like the white but not the yolk and formed some firm friendships that way (I later chose my husband following the same principle). The thing is we had to eat everything that was in front of us, regardless of our preferences. Looking through the kids’ recipes section of the Book, I saw lots of porridge, soups, zapekanki (bakes) and rissoles. Carrot and apple cutlets with semolina caught my attention, and since kindergarten teachers are not standing over to make sure I finish it, I thought I’d give it a go. Granny says she doesn’t remember having it, although anything is possible. “At kindergarten we had a teaspoon of fish fat followed by porridge for breakfast, soup, mash and rissoles with kompot for lunch, pastry and milk or tea for poldnik and zapekanka for dinner. Everybody hated kindergarten food, some parents would even take their children out because they weren’t eating anything. My mom was a manager and teacher at the kindergarten I went to. She was always very involved with the food, making sure it was as varied as possible and healthy — which was hard. She once fired a cook because she could taste there was no butter in porridge and found out the cook had been stealing it. In the later years at school, we had a cafeteria where we had lunch – soup, mash and cutlets usually, but also could buy different pastries and sweets. The ultimate item on a kid’s wish list was a Snickers bar. It was very sweet, expensive, American and you could keep the wrapping to show off later. Granny’s school years were a bit different: “At school we brought our lunch in and everyone would share and let each other take a bite. The girl who sat next to me in class always brought a lard, cocoa and sugar sandwich and ate it on her own – no one wanted to try that one. Recently there was a story in the Russian press about some kids in the city of Magnitogorsk who recently dug a hole under the kindergarten wall and escaped. Maybe they were running away from semolina porridge, kissel’ or boiled eggs. 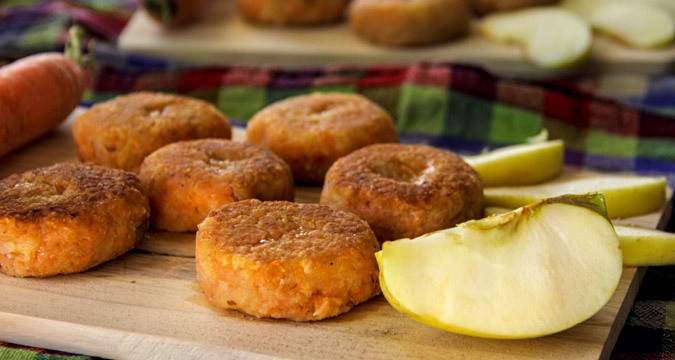 Had they served carrot and apple cutlets from the Book that would not have been necessary – they are delicious! Why is life not as good as the Book? Wash and carrot and apple and grate. Put the carrots in a pot. Add ¼ cup water and cook until soft. Add apples and simmer until apples are tender. Then add semolina, sugar and some salt. Boil for 5 minutes, stirring constantly to avoid lumps. Allow mass to cool. Shape in the form of cutlets and fry in butter.